This is another engaging collection of noblebright stories by the same editor, C. J. Brightley, who coordinated Fell Beasts and Fair: A Noblebright Fantasy Anthology, Luminous: A Noblebright Fantasy Boxed Set, and Still Waters: A Noblebright Fantasy Anthology. While I felt some of the stories in this anthology were a bit darker and many achieve a strange poignancy, overall it’s an amazing collection of stories. A benefit of these collections is I discover new authors to read and follow new authors, which is always a gift. Poignant tale of The Hanged Man, a man of fire and smoke almost returning to the land of the living. But then he has a chance to help members of the very village that tried to hang him, and he cannot allow that chance to pass. Can his love and fire save them? Had me tearing up at the end; I’m sure it was all the smoke in my eyes. Simone is an artist, a carver, allowing the wood to speak to her what it wants to be. As her entry for a competition, can she finish it in time? Can she limit herself to what will win, what will not anger the lords? Is there a way to win? Strong female character, lots of integrity. Dain is an assassin imprisoned and slaving to save another prisoner, a hostage to his affection for a blind man. When the Raven comes, everything changes. As Dain awaits whatever will befall him, he tells Orahn the story once again of how his village fell to the Shawek, the friend, Aythen, who turned back to avenge their people, and a wolf amulet. As Dain wonders what the visit means to the prisoners, his lethal collar is removed and he is sent forth to slay a demon. Can he slay the demon? Can he escape? Great twist, loved the multiple layers of story. Jade lives in a world of Alt-World-Collisions. Ever since her brothers disappeared into an alternate world during a past collision, Jade has been on her own with the help of Windbag, ahem, Windham, a sorcerer. Now she’s close to capturing and turning in her brothers, who were altered before they returned. They are no longer heroes, but criminals of the worst order. Can she capture them and stop their heinous crimes? Great ending and another strong female lead. Claire follows the advice of a hatchling and enters the doorway into the Aeries to search for Baiden, a knight carried off the night the dragons came. But the doorway leads further than she knows and her quest will affect the return of the King… if the dragons will listen to her message from the World Tree. Is it a false hope? Loved the layers and twists in this story. A nameless girl and Huayra are the only ones who see themselves – and yet it is not themselves – in the reflections of the pools and lakes of their world. But the reflections show another world, a world with a sky of fire, where their reflections are hungry and sad. Can she learn enough from her teachers to communicate with and help, Sofia, her other self? Can she save their world? Poignant and pointed, definitely needed my Kleenex. Senn has been asked to Bind the broken sword, the one that had been holding her people’s enemies at bay. Skerrast, the Lifeblade, a magical instrument of destruction has been shattered. But should you repair a sword that’s been the symbol and instrument of war? There will be war if it is destroyed and war if it is raised again. The hope and fear of the sword motivate everyone around Senn as she ponders the fate of Skerrast and the Clans. I love stories that open up new pathways and don’t force you into the most obvious choices. The paths of knights converge as they seek the Grail. As they venture into the castle of King Mabuz, each confronts a trial to earn the right to remove the Grail. Can any of them earn the Grail and its contents? Very cool lessons learned by the knights. Tessa is accidentally transported to another world when she confronts a boy vandalizing her refrigerator. Owain is more than a bit miffed that Tessa is throwing his transports off. Can he capture the lost shifter before his dad finds out? Dragons, T. rexes, undines, majicked umbrellas, magical horses, and a mischievous pooka. Here’s hoping this is the intro to a book, because this story just begs to continue (and so do I). Dwyer is becoming one of my favorite authors. Derla is digging a ditch for Rewk, an irrigation ditch to water trees, potential grapes, and more. Then a mysterious man rises out of the lake, and nothing may ever be the same again. Names are important, but Derla and Rewk have hidden their true names and selves from each other all this time. Will the past destroy what they’ve built? Dark and disturbing, with overtones of hope. Pharaoh has been wandering the world, seeking the five pieces of the wizard’s soul gem that contain his wife’s soul. He has all but one, which he bargains for from Apep, the dark god. Can he free his wife’s soul that it may rejoin her body? What price will he pay? A satisfying tale. Leola is a librarian who is offered a book, the only surviving book of true magic, from the White Tower. It should be powerless since the Prophet shattered the crystals and drained their magic. Can she resist the book’s compulsion? Another story that begs continuation. Baz is a troll, reborn over and over from the rock. No matter how he dies, he will reemerge from the rock, although each time he is changed, memories lost. But when he expends his energy to save a human, he may gain more than he loses. After the vile High Sorcerer convinces the other trolls to join his army, Baz’s memories and experiences show him what the other trolls are overlooking. Can he get them to see that the Sorcerer is just using them? Maybe there’s a better path. Interesting characters and a twisty ending. It’s Dragon’s Day, the day the village must appease the dragon with their promised offering of livestock. But the famine in the land has left the villagers short. The crisis is made even worse by the cowardly mayor and his men taking the village’s offering for the dragon and fleeing. Not to mention, the dragon has struggles of his own. Can Antonio save the village? Can he appease the dragon? Is there any way to save all of them? Overall, a very satisfying tale. Their god is dying, having been injured by another god in battle. Siad-Amak is all that stands between them and destruction by demons and raiders. Alssia and Idris must take his new idol into the desert and find a new god for their people. Awesome world-building and a very satisfying conclusion. A fable about a man and his body. Ral doesn’t take care of his body, whether it’s refusing to eat healthy or to chew hygienic nuts. One day his body rebels. It bargains with him to keep them both from death. Interesting concept, but one of the weaker stories in the book. Meredith collects shards of sea glass along the shore and one day discovers pieces of glass that are different, special, and she hoards them on her mantle. When she meets an old woman, can she sacrifice the shards of glass she treasures? Very cool twist to this story. Janessa and Vardan are leading a group of children through dark, dangerous tunnels, followed by monsters that gain on them, monsters that will devour them, or worse. When they stumble onto a trullock, there isn’t much hope. Mankind slaughtered all the trullock young long ago, and this trullock has created a memorial to hold the shards of its lost young. Even as Janessa and Vardan strive to save their village’s children, they must face the memories of the trullock and mankind’s responsibility for destroying a race. Another sad, yet hopeful, tale. Carter and Samantha must locate a missing glass window, a window imbued with angelic magic, that’s been stolen from a very special room in the cathedral. Demons would kill or worse to own an artifact holding more ceremonial magic than any other artifact in the world. Legions of demons are converging on the artifact, determined to have it as their own. Can Carter and Samantha get the window before the demons do? Fun, energetic story. Hope it’s an offshoot of a book! Dr. Matthew Hamilton is trying to mend a gargoyle at the Backside clinic, known for its willingness to accept supernatural beings. Pika Kahne has been accidentally breaking off parts of himself, and he’d like to be put back together before his owner finds out. After all, he’s supposed to be decorative. Luckily, Hamilton really is very good at his job and solving the mysteries it might involve. Cute story with interesting twists. Overall, another great collection from Brightley. Highly recommended. I received this book as an Advanced Reader Copy (ARC). My opinions are my own. 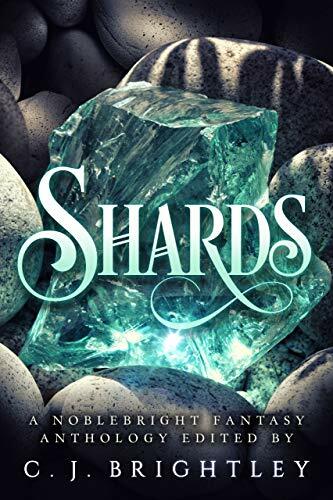 Shards of lives, shards of a broken heart, shards of broken pottery or glass, shards of myth and memory… each author in this exciting collection of fantasy has interpreted the theme in a different way. Focused on noblebright fantasy, this anthology includes stories that edge toward grimbright and nobledark, exploring themes of despair tempered by hope and brokenness tempered by redemption. B. Morris Allen, J.E. Bates, Jade Black, Gustavo Bondoni, Bokerah Brumley, Stephen Case, R. K. Duncan, M.C. Dwyer, Chloe Garner, Kelly A. Harmon, Pete Alex Harris, Ben Howels, Tom Jolly, Brandon M. Lindsay, Alice Loweecey, Jason J. McCuiston, Alex McGilvery, Ville Meriläinen, Jennifer R. Povey, Holly Lyn Walrath, Pat Woods, and Richard Zwicker.